Athletic Equation co-founder Alexander Papadopoulos and his wife and two daughters have been organizing ultra marathons—any race longer than 26.2 miles—for over a decade. But, three years ago, Papadopoulos’ daughter Katie, who was seven at the time, caught him off guard with a pointed question: Why aren’t there any women in your races? Papadopoulos wasn’t sure how to respond. He knew most ultra marathoners were men—roughly 70 percent for 50-milers and between 85 and 90 percent for 100-mile races. Papadopoulos points out that men were given a head start; even as recently as the 1970s, women weren’t allowed to run marathons in the Olympics. Swedish competitive ultra-runner Ida Nilsson agrees. “It wasn’t that long ago that you couldn’t run a marathon,” she says. But both are in agreement that they definitely think more women should give it a shot. “It is so amazing to be out there exploring on your feet all these amazing trails all over the world,” says Courtney Dauwalter—who not only runs ultras but, like Nilsson, routinely flat-out wins them. “More and more women are running and also being more competitive, so I think we will see an improvement of the number of women running ultras in the next ten years,” Nilsson says. 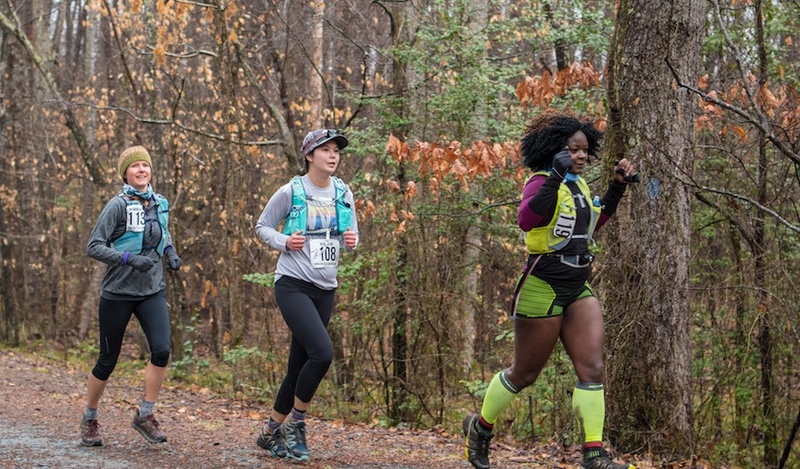 This month, Katie’s vision came to life through the No Man’s 50K, held in Triangle, Virginia. “It was great. In the morning the trails were muddy and we ended up with blue skies the last couple hours,” Papadopoulos says. “We had 40 people register and 23 finishers of the 29 starters—which is good considering we didn’t do much advertising.” What better inspo to get started than this? And though it may seem daunting, here’s everything you need to know, including how to train, what to wear, what to eat, and how to recover. He also says it’s important to train for whatever elements you’re going to experience. “If it’s going to be in the mountains, you need to stimulate some sort of climbing in your training,” he says. If part of the race is going to be at night, doing some night runs is definitely a good idea, because Papadopoulos points out that training at night is also a good way to prepare for the sleep deprivation longer ultras come with. What you’re going to wear on race day depends on what the climate is like for the race you’re doing. For the most part, it’s going to be your normal running clothes, such as shorts or leggings and a T-shirt. But one thing you’re going to want to get is a hydration pack to wear. “Hydration packs come with water ‘bladders’ or bottle holders and they have all these little pockets so you can stash your cell phone, layers, food and energy gels, and anything else you might need,” Dauwalter says. They also vary by size, so you can chose one on the smaller side for a shorter ultra, or choose a slightly bigger one for a multi-day race. As far as shoes go, Papadopoulos says to look for sneakers that have a lot of tread on the bottom. “You need that because you’re constantly kicking out rocks on the trails,” he says, adding that you’ll also want something with a little more cushioning than your average running shoe. You are about to be on your feet for a loooong time. “Don’t worry about brand loyalty as much as actually going to a specialty running store and trying them out,” he says. While you may solely rely on Gatorade and endurance gels during a road marathon, ultras require more of you. Dauwalter and Papadopoulos both say that part of your training should be figuring out what your digestive system can handle. “Everyone is different, so just because something works for your buddy doesn’t necessarily mean it will work for you,” Dauwalter says. She likes using Tailwind endurance powders, which have carbohydrates, electrolytes, and sodium and mixes it right into water. Papadopoulos says electrolytes tabs are extremely popular in ultras. For multi-day races, many runners consume caffeine, whether in coffee form, powder, or goos. “Again, it depends on what your body can handle,” Papadopoulos says. And then there’s the food. Unlike at road marathons, aid stations at ultras have long buffets of foods like mashed potatoes, grilled cheese, soup, quesadillas, chips, and candy. “Pickle juice oddly enough has become really popular, as well as olives, which are both good because they have salt,” Papadopoulos says. On a long race, Dauwalter says she likes to eat pancakes, quesadillas, and Honey Stinger Honey Waffles. You can either grab something from an aid station and eat on the go, or you can sit and rest for a bit, eating there. It depends on your race goals and what your body needs. Now of course, comes the 10 million dollar question. What goes in, must come out, right? Part of running long races means that you have to go to the bathroom wherever you can find a spot. “It depends on how much you care about someone seeing you, but you can go a bit into the woods if you need to,” Dauwalter says. “But we’re all out here doing this, so you have to realize that you might encounter someone going to the bathroom at the side of the trail.” But she promises it’s NBD, also adding that the aid stations often have portable bathrooms. If you’re on your period, bringing tampons, pads, or anything else you may need is really up to you, as the aid stations might not have them for you. Be sure to come prepared. You may think that after running 50—or even 100 miles—your body deserves to not move at all for at least a few days. While this may work for some people, Papadopoulos and Dauwalter both prefer active recovery. “I think the best way to recover is just walking around the block or on the treadmill to get the blood flowing again,” Papadopoulos says. He also acknowledges all the emotion that goes into running an ultra. “It can be such a high that some people feel depressed after,” he says. “You do all this training and look forward to it, but then it’s like, ‘now what?’” To help with those feelings, he likes to tell people to have their next race already in mind. “It doesn’t have to be something so aggressive—it could be just a 5K—but something to look forward to,” he says. That’s the great thing about the running community. There’s always another new race to discover. Having a virtual fit squad on your side can help keep you motivated during your training. And if you’re wondering what a pro runner eats on a regular basis, check out Olympic hopeful Colleen Quigley’s food diary.